Except on 21st July 2014 Discovery’s Animal Planet showed that same wolf program at 10pm in Britain. And where else on world TV will they continue to desecrate wild animals in this way? I watched it and here are some comments: … Based entirely on a false premise of there being insufficient natural prey causing wolves to attack humans. Not so… Claimed to be a “Special” = especially bad for the wolf… Huge exaggeration of a few selected over-dramatised cases (apparently)… Grotesque (undisclosed) reconstructions, unconvincingly, peppered with sub-standard amateur footage of snarling wolves… Endless, relentless “fang TV”… Frequent “deadly”, with emotive music stimulating American predilection for attack and aggression… Will do as much harm to wolves as Jaws has done to sharks, what the Benchley’s so regretted, as, surely, Animal Planet will, in this production which degrades the producers, the cameramen and all the wretched team that made it. I have made several films on wolves, as they are. For the BBC Natural History Unit, we made The Wolf Saga about the last female (with pups) killed in Sweden. Since then numbers have increased by helping farmers and educating the public. The situation is still very bad in next-door Norway whose farmers lose hundreds of sheep in the winter weather, but if one wolf kills one, probably dying, sheep, that wolf brings out the worse primitive revenge from a country considered to be very civilised. Animal Planet’s Man-Eating Super Wolves will only inflame that attitude if their very misleading lie is shown there. Since leaving the BBC, I’ve filmed Wolves across Europe – from Portugal and Spain to France and Italy, on eastwards to Scandinavia, Estonia and Russia. Apart from the wretched Norwegians, and despite despicable Animal Planet, wolves are now being accepted in nearly every European country. Indeed, they are seen as a tourist attraction in countries that need that income, such as Romania, a stronghold of wolves and bears in Europe. I also filmed there. If Animal Planet gets a People’s Award at Wildscreen this year, it should be for the most obscene two-faced (self-censored) and anti-wildlife show ever seen on world television. 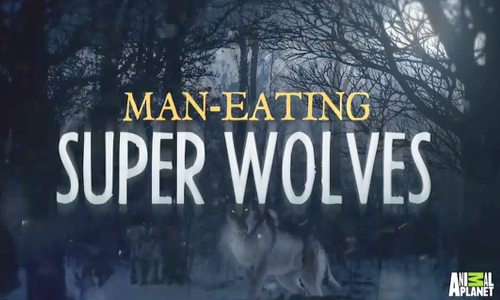 Kids4Wolves - "Man Eating Super Wolves" Don't believe everything you see on TV. Alternatively see it here (not endorsed by us but available should you wish to watch it there). NB. The show starts with this disclaimer: "The following program contains content that is speculative. Wolves are a revered species that rarely attack humans."